not to tempt you or anything . . . 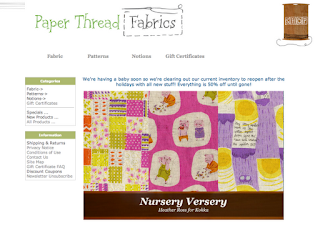 But you should go check out Paper Thread fabrics. They are clearing out all of their inventory and everything is at least 50% off. I just put in an order for some Nursery Versery (only $10/yard, that's a good price for Heather Ross!) and some quilt batting. They also have some Anna Maria Horner, Tula Pink, Lizzy House, etc and lots of patterns. Their stock is already dwindling down but there are some good things left! I definitely just got a new, big cutting mat. I've been wanting one for quilte a while and this was just the reason! I may have also gotten some stash fabrics, just maybe.